A tasty breakfast buffet awaits guests every morning at The Unterwimm. Those with a sweet tooth will find jams, fruit, yoghurt, muesli, cereals, orange juice etc. For those who prefer a more hearty breakfast we offer a selection of cheeses, sausage meats, bacon, spreads, eggs, a variety of different types of bread and other tasty treats. You’ll find free Wi-Fi internet throughout the whole house. 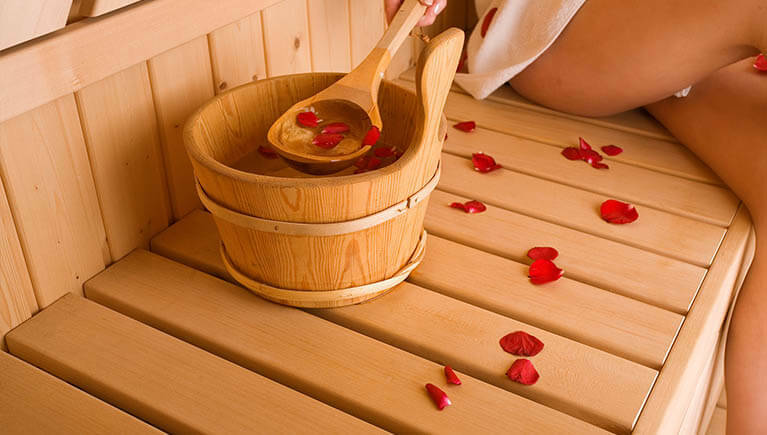 The tastefully decorated spa area can be used free of charge by our guests. Here you’ll find a sauna, an infra-red cabin sauna, relaxation loungers plus a shower. We offer our guests Reiki sound massages on request. We provide a cot for our youngest guests. There are plenty of free parking spaces in front of The Unterwimm. We do not allow pets and kindly ask for your understanding. We are a non-smoking house. Smokers may enjoy their cigarettes outdoors. Rooms are ready by 3.00 pm on day of arrival. We kindly ask you to vacate your room by 10.00 am on day of departure. We reserve the right to charge a short stay supplement as well as a single room supplement. Enjoy a number of discounts on admission to museums, sights & attractions in the area with the Wagrain guest card. You receive your guest card free of charge on arrival at The Unterwimm. To confirm your booking we require a deposit to be transferred to our bank account. The remainder should be paid either in cash, with EC or credit card on the day before departure. As a booking is a purchase agreement, cancellation fees are incurred in the event of cancellation, late arrival and early departure. We therefore recommend you take out travel insurance.